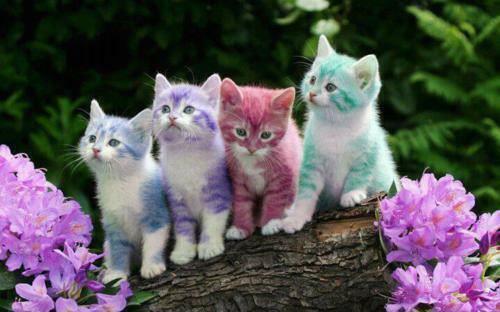 colorful बिल्ली के बच्चे. . Wallpaper and background images in the जानवर club tagged: animals cat cats kittens kitty kitties cute colorful adorable. This जानवर photo contains बिल्ली का बच्चा, किटी, किट्टी, टॉम, बिलाव, and टॉमकैट. There might also be बिल्ली, सच्चे बिल्ली, सच बिल्ली, गुलदस्ता, कंचुकी, कहावत, फूलों का गुच्छ, चोली, पॉसी, नाकगेय, ब्रोच, nosegay, अफीम, papaver somniferum, अफीम अफीम, and पेपावर सोमनिफ़ेरम.